The Marcellus Shale is a geologic deposit of sedimentary shale that underlies much of Pennsylvania, West Virginia, New York and Ohio (Fig. 1). The deposit was formed 400 Mya years ago during the Devonian age when this portion of the continent was an inland ocean, as sediment (mostly clay) and organic matter (mostly algal biomass) settled on the floor of the ocean basin. This deposition formed an organic-rich mud that, over geological time and with subsequent burial, became sedimentary rock. Under high pressure and increased temperatures, a portion of the organic matter in the sedimentary deposit was converted to methane (CH4) gas. The Marcellus Shale is the largest gas-bearing shale deposit in the U.S. (Fig. 1), and is estimated to contain approximately 500 trillion cubic feet of recoverable natural gas (Engelder 2009). While the presence of CH4 gas in shale deposits has been known for some time, economically feasible extraction of this natural gas has become possible only recently (Kerr 2010). While conventional oil and natural gas extraction involves drilling wells into naturally occurring reservoirs of gas or oil, the gas in shale deposits is distributed throughout the sedimentary rock. Therefore a single well would access only a small amount of gas. To increase the efficiency of gas extraction in shale deposits, a process known as hydraulic fracturing (“fracking”) has come into practice (Fig. 2). During hydraulic fracturing, the wall of the well is perforated in numerous spots wherever the well comes in contact with the shale, and the shale surrounding the well is then fractured by the injection of water, sand and chemicals at high pressure. CH4 can then travel through the fissures created in the shale to the well, greatly increasing the efficiency of natural gas extraction. In addition, after drilling vertically to the depth of the shale, wells can now be drilled horizontally through the shale (for thousands of meters), and multiple horizontal wells can lead off of one vertical shaft (Fig. 2). These advances greatly increasing the amount of shale that a single well comes into contact with, further increasing natural gas production potential (Kerr 2010). There are some notable benefits to natural gas extraction from the Marcellus Shale (Howarth et al. 2011). Natural gas is a relatively clean fossil fuel, producing little pollution (such as aerosols, carbon monoxide, sulfur dioxide, and nitric oxide) compared to the combustion of oil or coal. Producing electricity with natural gas is also relatively efficient, producing less carbon dioxide (CO2) per unit energy than other fossil fuels. There are substantial economic benefits to natural gas extraction. In Pennsylvania in 2008, natural gas extraction from the Marcellus Shale was estimated to create revenues of over $2 billion, tax revenues exceeding $200 million, and 29,000 jobs (Kargbo et al. 2010). For some landowners in the Marcellus Shale region, leases and royalties from gas extraction companies have proved lucrative. Hydraulic fracturing and extraction of natural gas from the Marcellus Shale, however, poses significant environmental and public health challenges (Fig. 2; Kargbo et al. 2010; Howarth et al. 2011). Drilling requires the creation of roads and well-pads that can result in substantial land-use change, potentially impacting forested ecosystems. During drilling, waste products (rock and liquid brine associated with the shale rock) are brought to the surface, and these wastes may contaminate surfaces waters. The shale contains high concentrations of toxic heavy metals, and radioactive uranium (Bank 2011). Seawater trapped during shale formation forms naturally occurring liquid brines associated with the shale deposits, which contain high concentrations of gases, salts (notably chloride and sodium associated with ancient seawater), radionuclides, and heavy metals (Warner et al. 2012). Large quantities of water are used during the drilling operation to cool the drill bits and flush rock cuttings from the well. Once the drilling is complete, the perforation and hydraulic fracturing procedures require injection of large quantities of water mixed with sand and chemicals at high pressure. The specifications of chemicals added to fracturing water are often not disclosed, as hydraulic fracturing activities are exempt from the Safe Drinking Water Act (Howarth et al. 2011). The water coming out of the wells during drilling and fracturing, termed “flowback,” can become contaminated with radioactive substances, heavy metals, and salts upon mixing with the brine and shale. Flowback water is typically either stored on-site in retention ponds, or trucked offsite to treatment plants. However, reports of leaking retention ponds (Urbina 2011) and unapproved disposal of flowback, including dumping of flowback in streams and spraying flowback water on roads to control dust, are abundant. Once drilling and hydraulic fracturing activities are complete, there are ongoing concerns about contamination of water resources from natural gas wells in the Marcellus Shale (Howarth et al. 2011). Flowback continues for the lifetime of the well, producing ongoing disposal and potential contamination issues. Wells are drilled more than 1 kilometer deep into the shale through overlying layers, often including aquifers used for drinking water. The wells are lined and cemented, but with over 1 km of vertical rise in the well it is difficult to verify complete sealing of the well, and the potential for communication between the well and surrounding groundwater exists (Fig. 2). 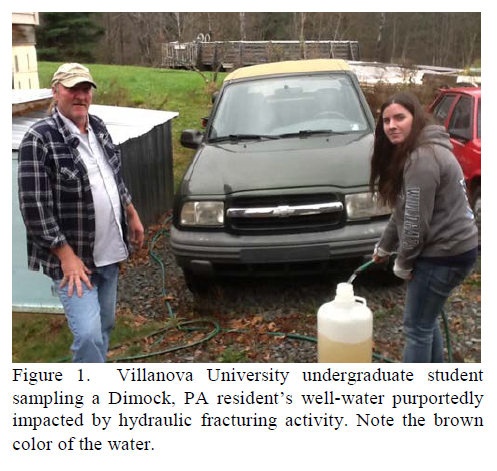 There have been reports of discoloration and CH4 contamination of drinking water from groundwater wells by residents within areas of active natural gas extraction activities (Osborn et al. 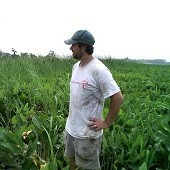 2011; Urbina 2011; Fig. 3). Extracting natural gas from the Marcellus Shale therefore may increase the risk of contamination of both surface and groundwater resources (Fig. 2; Howarth et al. 2011). Shale often contains high concentrations of naturally-occurring uranium. Uranium is found in relatively low concentrations in seawater, but the accumulation of sediments and organic matter leading to shale formation can efficiently strip uranium from seawater and store the uranium in sedimentary deposits that later become shale (Swanson 1961). Uranium is quite insoluble and therefore not mobilized during well drilling or waste (spoils and brine) management. 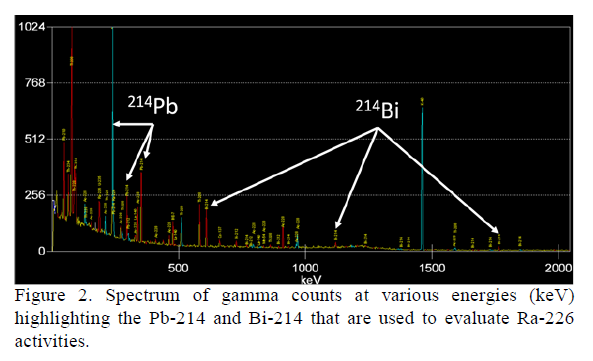 However, uranium (mostly found in shale as the isotope uranium-238 with a half-life of 4.5 billion year) decays through a number of steps to an intermediate, radioactive daughter product radium-226 (Ra-226; Fig. 4). Radium is fairly soluble in water, and can be found in high concentrations (sometimes exceeding 10,000 pCi L-1) in Marcellus Shale brine water (Rowan et al. 2011; Warner et al. 2012). The EPA drinking water standard for Ra-226 is 5 pCi L-1, and there is evidence for transport from shale brines to shallow drinking water aquifers (Warner et al. 2012). Concerns have been raised about radioactive contamination of water resources from natural gas extraction activities (Urbina 2011). Sedimentary shale also can contain relatively high concentrations of toxic heavy metals such as barium, chromium, and zinc (Bank 2011) and these heavy metals can be found in brines associated with shale deposits (Warner et al. 2012). Further, the removal of shale from wells to landfills exposes the shale rock to oxygen. In a process similar to acid mine drainage, iron-sulfate minerals (such as pyrite, FeS2) in shale can be oxidized producing sulfuric acid. The acidic conditions promote dissolution of heavy metals from shale, potentially leading to acidification and heavy metal contamination of receiving waters (Poole 2012). Question: Does natural gas extraction from the Marcellus Shale impact stream chemistry? Hypothesis: Streams draining areas with well pads will have elevated Ra-226, heavy metals, and total dissolved solids (salts). Question: Is contamination from natural gas extraction activities delivered to streams primarily through surface (overland) flow or through groundwater flow? Hypothesis: Dilution of Ra-226, heavy metals, and dissolved solids during high flow conditions (following precipitation events and overland runoff) compared with base-flow (low flow) conditions indicates that shallow groundwater is the major pathway of contaminant delivery.